If you are struggling in places like expert dungeons just run 51bd. 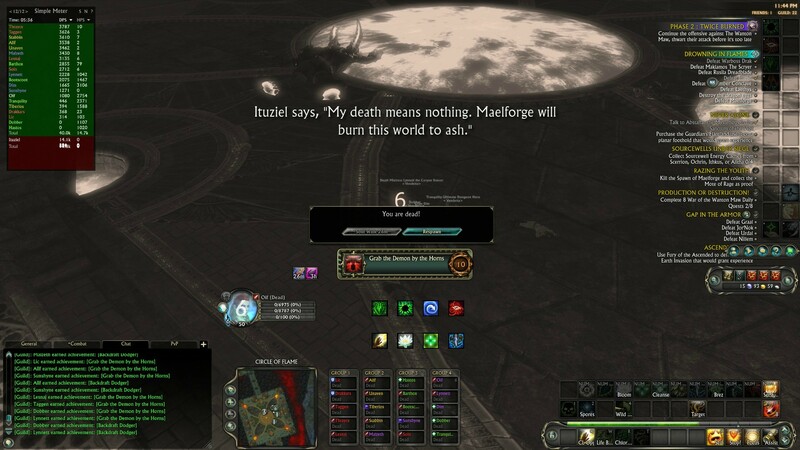 You can kill most bosses in the time blade and soul parity is up. I'd rather have a warrior's energy regeneration than Grim Satisfaction. As it stands now, either go 51 MM or spec into Combat Efficiency. However, don't use the Ranger Crystal without Clover/Fervor or you'll end up starving. Thread title reminds me of one of those 5 hr energy commercials. Being able to be energy starved is the whole flippin' point of having an energy bar in the first place. If you're never energy starved, Trion might as well scrap the whole energy bar altogether. I know that RIFT doesn't have this but I wish they did and thats to be able to augment your energy with some gear. Have gloves that give 25 energy or a rune that gives energy regen boost. Something that gives you some control over your energy instead of, here, this is your energy, its not enough? Too bad. The only thing that would fix our energy problems is energy regen, not just a flat number. Having 200 energy doesn't make much of a difference after the first 10 seconds. 1)We should be energy starved without fervor. 2)No spec should be energy starved with fervor. 3)WTB what Controlled Fire (Energy wise) gives, aka what they passively gave Warriors 3-4 months ago, -10% Energy cost on everything with a cost above 10 energy, on every spec. Now the non-BD/Non MM specs wont be energy starved even with fervor and tablet and require joy everytime its on CD! There is no sense what so ever in adding energy to our pool, it would only extend the same result. I am fine with having to manage our energy, but no build should go starved with bard and tablet ever. Yet, stalker still can. I am not suggesting that we get the same adjustment as warriors, because they are just flat broken in theirs, would only lead to yet another nerf to rogues down the line. Last edited by Taleon; 02-27-2012 at 12:02 PM. In another thread we crunched some numbers (I did so very badly) and concluded that 27 Energy/sec is the mark. That is a 17.3% increase in regeneration and would see us able to execute maximum DPS rotations while Fervor is active with only occasional starvation in Bloodstalker without a tablet. In short, 27 is the new 23. Here is the thread he's talking about. My takeaway is that bloodstalker consumes a tiny-bit-less-than 27 energy per second with fervor using 5 CP finishers. What our energy regen should be depends on your perspective of how tablets should be used, but 23 is certainly too low. I 100% agree. I think Trion used Warriors as a test for a FINAL power management fix, they had been goofing with this balance for a long time, first gave rogues a very minimal regeneration bump. Then they tried to alleviate warriors by globally nerfing power costs of all skills by a very slight margin. Both of these fixes hardly, if at all, helped either class. Warriors and rogues remained in the same struggle where even in raids with Fervor + Tablet, we would both get energy starved... Hindering both our builds and dps rotations. Then Trion finally slapped on a massive fix for warriors, a power regen buff that skated along a fine balance between never managing their resource and not having enough of said resource. After PTS adjustments 2x-3x times they finally got warriors to a good balance. Rarely struggles with Fervor up (still can get power starved if certain rotations are spammed longer than 5min, heavy testing simply meant special circumstances), and outside of Fervor, power management was a slight factor but was not a harsh limiting factor anymore. Balance was achieved. I do not agree that warriors regen is "broken". Their regen was OP in PTS, but was tweaked enough in PTS to have reached a good balance on Live. I think this same regeneration balance needs to be tested and worked out for rogues. HOWEVER< keep in mind this will have to be balanced with DPS skills, since rogues have only 1sec GCD, if they get the same power regen rate as warriors their spam capabilities will exponentially increase which translates into mass gains for long duration DPS. When they implement an energy regen buff to rogues, i hope they have the forethought to also heavily test dps in order to keep it balanced. This dps vs resource management was ultimately observed for warriors since outside of AoE encounters, they are still competitive but not over powered after they properly got a few dps skills nerfed/mechanics changed (multiplicative skills changing to additive). TL; DR? I agree, there is no real reason to keep from giving rogues a proper energy regen like warriors... but heavy testing to keep 1 GCD spamming vs endless power regen BALANCE will be necessary. Looking at warriors in my raid, they never drop below 70 power even on long fights with high uptime. Tablets are obsolete for warriors. Warriors got overbuffed again. It's just a fact. Tablets and/or perfect use of VoJ should be needed for the highest DPS builds on fights with complete uptime. Tablets shouldn't be needed on utility builds or fights with melee separation.